COME WATCH & MEET THE ARTISTS! 2 to 6pm – in Historic Downtown San Angelo and the River area near the San Angelo Museum of Fine Arts (One Love Street). 7:00pm – SPONSOR WELCOME PARTY for the ARTISTS (private function) at the San Angelo Museum of Fine Arts, One Love Street. SCHEDULE UPDATE due to Weather! EnPleinAirTEXAS Artists have a FREE PAINT DAY this afternoon. There is no telling what fabulous subjects they are going to discover and where they will end up painting. Check Gallery Verde Monday or Tuesday to see what caught their eye and how wonderfully they captured it! Pick up Free Event Guides! Come view new Fresh Paintings daily! Most are available for purchase early! All morning you’ll find the Competition Artists at the Civic League Park in San Angelo, 2 North Park St. Everyone is welcome to COME WANDER & WATCH for FREE as they paint in this spectacular sunken garden! Tickets for the brunch are sold out. Extra parking available at St. Paul's Presbyterian Church. Handicap spaces available in front of the gardens and the paths are wheelchair accessible. View and Purchase Fresh Paintings from the week! Competition Artists painting on private ranches and in the area. Thursday is last day to Purchase Paintings before the weekend exhibit! 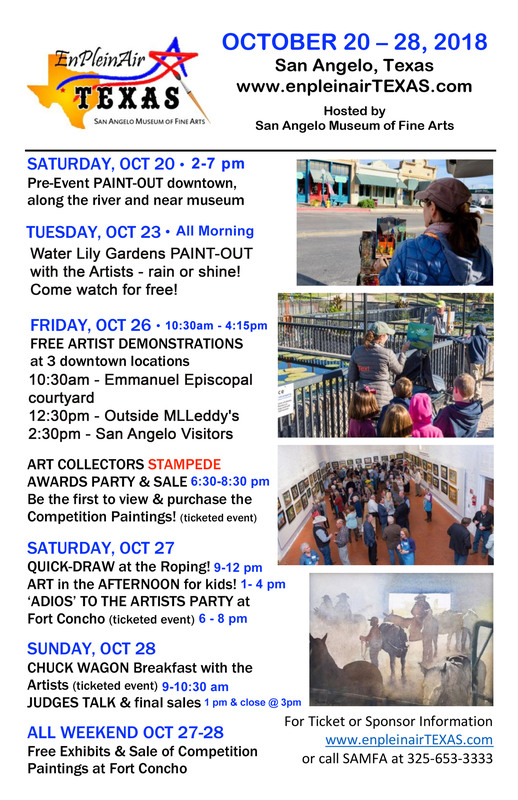 Come enjoy FREE talks and demonstrations all day in Downtown San Angelo as our artists welcome you to watch, ask questions, and learn! Locations and participating artists will be listed soon. 10:30am to 12:30pm - Emmanuel Espicopal Church Courtyard, 3 S. Randolph St.
Join fellow art enthusiasts for your first opportunity to see the 2018 COMPETITION PAINTINGS - two paintings selected by each Artist - that are judged and winners awarded over $15,000 in cash prizes this evening! In all, over 250 fresh and one-of-a-kind diverse interpretations of our West Texas area are showcased tonight and FOR SALE by 34 of the top award-winning Plein Air painters in the country! 6:30 to 8:30 pm - Quartermaster & Commissary Buildings at Fort Concho, 600 Burgess Street. TICKETS are $100 and include a $100 credit towards purchase of a painting in the exhibit. Purchase tickets early online, at Gallery Verde, or at the door. 7:00 pm - AWARDS PRESENTATION by 2018 judge Kenn Backhaus of Pennsylvania! The artists donate a portion of all sales back to benefit the San Angelo Museum of Fine Arts education programs in their 18 county service area. • Register at the event that morning, to paint in this fun competition. in the 2 1/2 hour Quick Draw Paint-Out at the San Angelo Fairgrounds! 9:00am – COME WATCH or COME PAINT! All area Artists (18 yrs. & older) are invited to join with our 34 Competition Artists in this year’s Quick Draw Paint-Out at the San Angelo Roping Fiesta! In a short 2 ½ hours, artists will attempt to ‘lasso’ the essence of West Texas on their canvasses. COME WATCH FOR FREE! Wander the fairgrounds and find our 34 Competition Artists as well as artists from across the state, here to paint cowboys & horses, the action at the indoor roping arena, and hundreds of kids & animals at the junior livestock show. So much to paint! WANT TO PAINT? Register online or at Gallery Verde during the week, or at the Fairgrounds between 8am & 9am for a $10 Registration Fee if you want to paint in this fun competition. 11:30am – with a big HOOEY! The artists must stop painting & frame their artwork for judging. By the way, a “HOOEY” is the final loop by the rider when roping a calf. Artists, easels and paintings are corralled at the big STAR in front of the Housley Building (maps available). 2018 EPAT judge Kenn Backhaus announces the winning paintings and awards $2850 in cash prizes. All Paintings are for SALE and now is your opportunity to visit with the artists and ‘rope yourself a colorful memory’ of cowboys & paintbrushes - benefitting these amazing artists AND the San Angelo Museum of Fine Arts! The Competition Artists will be in the stands, capturing the action in the longest running stand-alone roping event in the world! Roping tickets are $12 and may be purchased at the gate. These paintings may be purchased this afternoon and picked up (framed) at Fort Concho on Sunday. 9am to 5pm – Open FREE to the Public at Fort Concho, 600 Burgess St.
View and purchase your favorites from over 250 paintings painted ‘en plein air’ this week! Cast your vote for the ‘STRAY CALF AWARD’! Come paint a picture with us! Come & go as you please. Say 'ADIOS' to the ARTISTS! 6 to 8:00 pm – Quartermaster Building at Fort Concho, 600 Burgess St. Put on your best Western Bling for a night of food, dancing, and unlocked treasures at old Fort Concho! Mingle with your favorite EnPleinAirTEXAS Artists, surrounded by all the West Texas treasures they have painted this week. Don't miss the excitement and surprise guests at 7pm! 7:00pm – “MINI-PEARLS of the CONCHOS” Exhibit GRAND OPENING! 34 paintings 6”x 6” or 6”x 8” that were painted this week by the Competition Artists & can be purchased TONIGHT! $1500 in cash awards handed out by judge Kenn Backhaus. CHUCK WAGON BREAKFAST WITH THE ARTISTS & ROPING PAINTINGS! Historic Fort Concho, 600 Burgess St.
Tickets must be purchased ahead of time online or at Gallery Verde by Thursday, Oct. 26th. SOLD OUT! 9:30am – “OUT OF THE CHUTE! !” – Roping Painting Exhibit Opens and ALL are for sale only until 3pm today! Commissary Building at Fort Concho. LAST DAY ARTIST EXHIBIT & SALE! 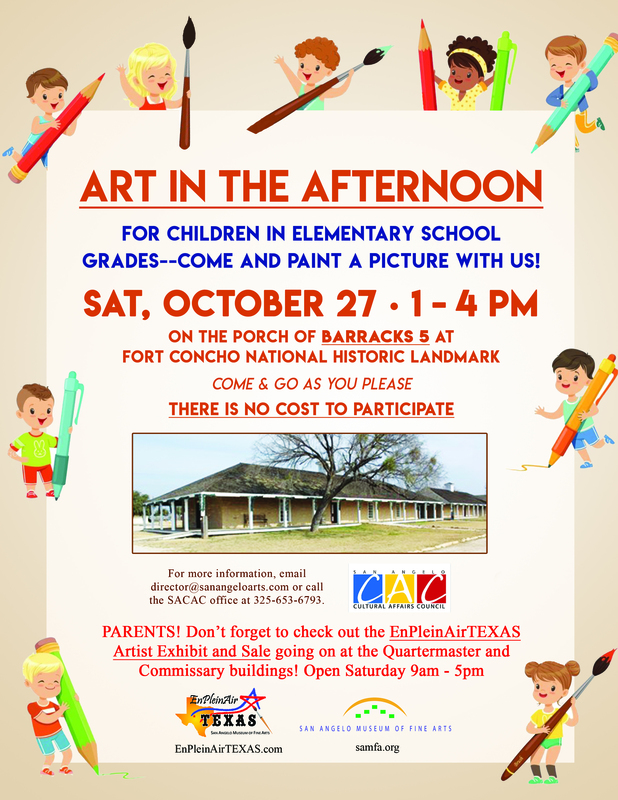 9am to 3pm – Open FREE to the public at Fort Concho, 600 Burgess St. Your last chance to visit with the Artists and purchase artwork from a week of painting on ranches, parks and rivers, and out at the roping fiesta! And don’t miss the Mini-Pearls (small paintings from this week) exhibit and sale now open to the public! Today is the last day to place your personal vote for the painting YOU feel was lost and should have gotten an award! The judge will award a $500 prize to that painting at 1pm today! Kenn will share insights on his choices for the prize-winning paintings. Free to everyone. 2 to 3pm – FINAL SALE for 2018! Your very last chance to take home an original treasure from one of our 2018 award-winning EnPleinAirTEXAS Artists! Join us next year, October 20-27, for the 2019 EnPleinAirTEXAS! Tickets for events may be purchased in advance by calling the Museum, or at Gallery Verde, 417 S. Oakes St, Oct. 22-25, 9am to 5:30pm. Tickets are also available online at www.enpleinairTEXAS.com and may be picked up at Gallery Verde in advance, or at the door at the event you are attending.